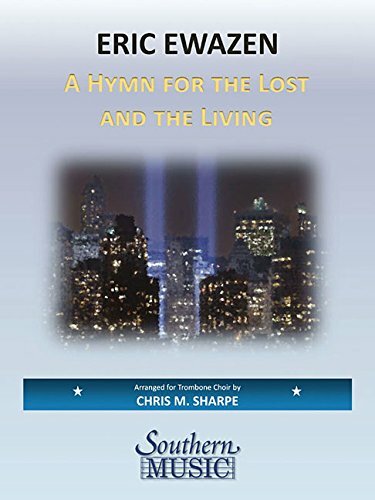 A Hymn for the Lost and the Living is a musical response to the American national tragedy that occurred on September 11, 2001. Its expression ranges from quiet and intimate to bold and heroic. It has been arranged for many different instrumental combinations but its original manifestation was for band—a commission from the United States Air Force Heritage of America Band. Sharpe undertook this trombone choir arrangement while a doctoral student at the University of North Texas. The UNT trombone choir premiered the work in February 2014. Sharpe has done superb work with this setting. He arranges it for ten tenor trombones and two bass trombones. The work is organized in contrasting choirs. The upper parts tend to carry the main melody and the lower parts the hymn-like sections. The middle parts often contain the florid accompaniment that is reserved for the woodwinds in the band arrangement. At crucial musical moments the whole choir joins together in sounds powerful and transcendent. Sharpe balances the high tessitura of the upper parts, up to d2, with ample rests. Performers need to be solid but not superhuman. Although each part has important and engaging material, the middle parts, 5-8, are the most difficult to execute technically. This is a challenging but immensely satisfying work. It can serve as the centerpiece for a recital or as a stand-alone ceremonial work.